Charlotte, NC – The Johnson C. Smith University men’s basketball team received the 2014 John B. McClendon Sportsmanship Award during the finale of the 2014 CIAA Tournament held at Time Warner Cable Arena. In addition to the team award, senior forward Antwan Wilkerson (Greensboro, NC), junior forward Emilio Parks (Ashtabula, OH), and junior guard LaMarquis Letchaw (Dallas, TX) were all named to the 2014 CIAA All-Tournament Team. The John B. McLendon Sportsmanship Award is the most prestigious award presented by the CIAA Tournament Committee. The award honors individuals and institutions involved in basketball for their displays of tremendous sportsmanship on and off the court, as well as their positive contributions to the game. 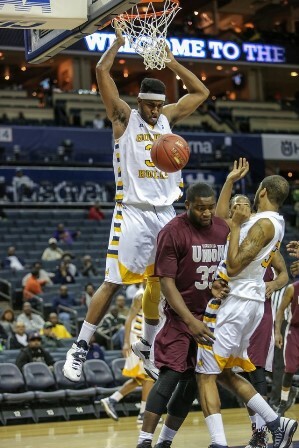 This is the second consecutive season JCSU men’s basketball has received the honor. Out of the 10 All-Tournament selections, there were three Golden Bull recipients; more than any other institution. In the four tournament games played, Wilkerson scored 50 points and grabbed 43 rebounds. He had two double-doubles along with seven blocks. Parks adds All-Tournament honors to his All-CIAA selection received this season. He scored a team-high 80 points, averaging 20 points per game in the four tournament contests. Parks also pulled down 17 rebounds and had five blocks. He was named the Food Lion Most Valuable Player in the Golden Bull wins’ over Virginia Union and Virginia State. Letchaw made an impressive CIAA Tournament debut. He was second on the team in scoring with 64 points, averaging 16 points per game. Letchaw also recorded 17 rebounds, nine assists, and six steals. In the 81-77 victory against Bowie State, Letchaw had 20 points and four assists en route to being named the Food Lion Most Valuable Player.